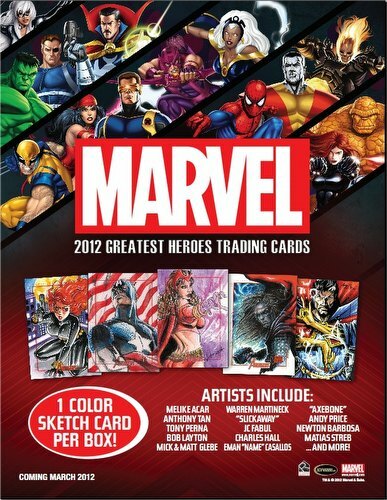 Every Marvel 2012 Greatest Heroes box includes 1 Hand-Drawn Color Sketch Card! Artists include Melike Acar, Axebone, Charles Hall, Eman "Name" Casallos, Anthony Tan, Slickaway, Andy Price, Tony Perna, JC Fabul, Newton Barbosa, Bob Layton, Matias Streb, and many more! The base set includes 90 foil-stamped cards. Collectors can also look for a 6-card Icons Shadowbox Set, and several other levels of bonus cards. 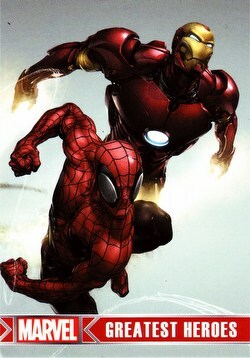 Each case includes a 3-card Greatest Heroes puzzle. Case incentives include a 6-case Painted Sketch card by Mick or Matt Glebe, a 9-case Warren Martineck color sketch card (with each card featuring a key date and moment in Avengers history), and an 18-case Archive Box.